I hope to have links to detailed, high-quality maps of Baltimore circa the various stages of Mencken’s life. The best I’ve found so far dates eleven years before his birth. 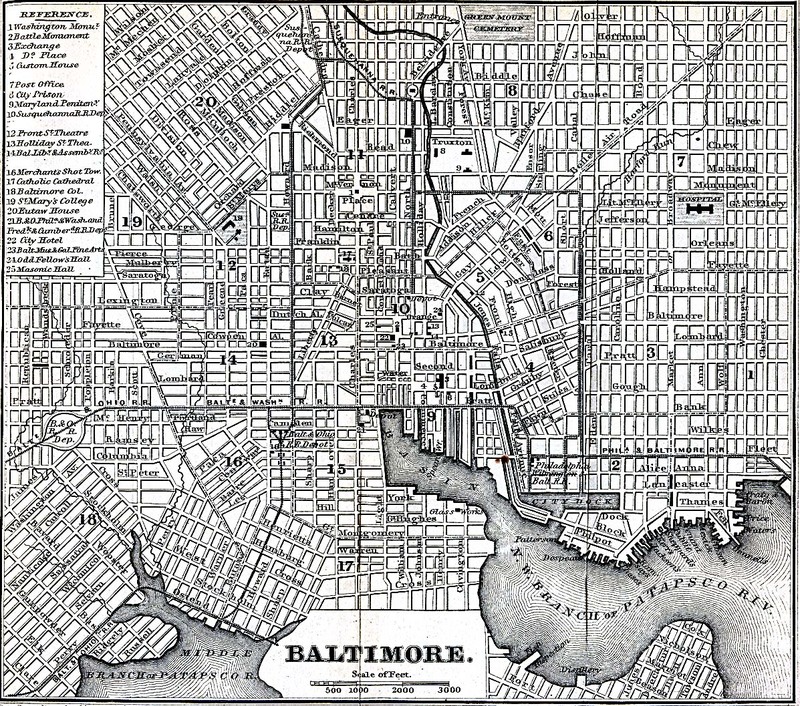 The streets of Baltimore were renumbered in 1886 September through December. Polk’s City Directory for 1887 has a table mapping from the new numbers to the old. In the addresses below, the original number is given with, if applicable, the new number in square parentheses following. On Sunday, 1904 February 7, at 10:48, Engine Co. 15 received an alarm that there was a fire at John Hurst & Company. When the fire, dubbed “The Great Fire of Baltimore”, was brought under control 31 hours later, 140 acres of central Baltimore, more than seventy blocks, encompassing 1,526 Buildings and accounting for 2,500 business, banks, enterprises and merchants, were destroyed. When the area was rebuilt, streets were renumbered, adding a complication to those who wish to coordinate localities of old with present-day street numbers. Location: 380  West Lexington St (Between Freemont and Poppleton), Baltimore, MD. Remarks: HLM’s boyhood home, and where he returned to in 1936 and lived out his life with his brother August. August lived in the house until his death in 1967 May 19. HLM’s father, August, bought the house for $2,900 in 1883?. Before becoming a museum, the building was used for office space by the University of Maryland School of Social Work and as a residence for VISTA volunteers. With the closing of the Baltimore’s City Life Museum, which ran the house, the Mencken house is now closed. The house is not far from Edgar Allan Poe’s house and the wonderful B&O railway museum. Visiting all three makes for a pleasant Sunday. Directions: (1) Take I-95 South. (2) Take right Exit 53: I-395 North / Downtown to Martin Luther King Boulevard and bear right. (3)The road bifurcates: the left goes to I-395 Downtown/Inner Harbor, the right, to M.L. King Jr Blvd/Russell Street. Do not head for the Inner Harbor. Keep right to go to Martin Luther King Boulevard. (4) Once on MLK Blvd, migrate into the left lane. Do not exit onto Russell Street but keep bearing left, to MLK Blvd / I-83. (5) Make a left turn onto West Lombard St. (6) Right turn onto S. Calhoun St. (7) Left onto Hollins St. (8) On your left will be Union Square Park. (9) HLM’s house is near the far end of the street. Remarks: In 1885 August Mencken moved his cigar factory from Baltimore Street to Paca Street. Remarks: The factory burned down in December, 1893. Location: Pratt and Greene Sts. Remarks: Under the management his Uncle Henry and his son, the firm of Aug. Mencken & Bro. went bankrupt in January 1926. The business was in poor shape for several years, but the precipitating event was Uncle Henry’s bad investment in a western mining venture. The building was sold. Location:2400 West North Avenue (between Moreland Ave. and North Warwick Ave.), Baltimore. The site is now (1999) occupied by St Stephen’s Court Apartments. Remarks: HLM and Sara Powell Haardt were married here on 1930 August 27. Location: 412 North Howard St (Betw. W. Franklin and W. Mulberry Sts). Remarks: No longer extant. Schellhase’s back room was the meeting place for the Saturday Night Club from 1918 until its dissolution in 1950. Location: 106 W. Saratoga St (Betw. Park Ave. and Cathederal St). Remarks: Marconi’s was established in 1920 and is still in business. See a reviewed in Zagat’s Guide. HLM and Sara often ate here when HLM was wooing her starting in 1923. In 1939, Mencken was acquainted with Clare Leighton, and they dined at Marconi’s. Mencken also dined at Marconi’s with Marion Bloom. Remarks: HLM and Sara Haardt Mencken (1898-1935), his bride, set up house in the third-floor apartment in 1930. Location: 913 North Charles Street, Baltimore, MD. The site is now (1999) a parking lot. Remarks: The Peabody Book Shop was opened in 1922 by Siegfried Weisberger, a self-educated man who immigrated from Austria in 1912, and his brother. Siegfried took over management of the store in 1931 and expanded it by adding a Beer Stube (“room”). Weisberger shared HLM’s passion for Nietzsche and Beethoven. (Source: Martin, In Defense (1996), pp. 366-367). Location: Enoch Pratt Library, First floor Annex, 400 Cathederal St (Betw. Mulberry and Franklin Sts), Baltimore, MD. 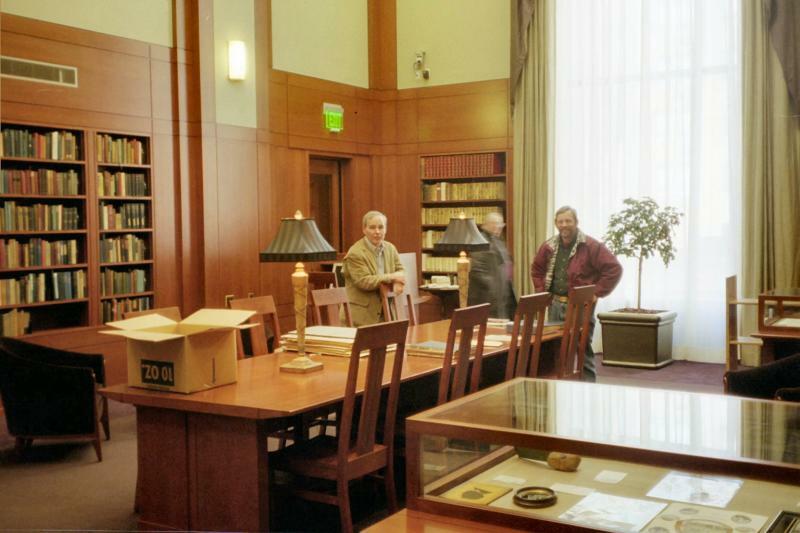 Remarks: The Mencken Room is closed to the public except on Mencken Day in September (on or about Mencken’s Birthday, 12 September) and by appointment. Hours: Open during normal hours on Mencken Day in September. Directions: Enter the library through the Catherdral Street entrance. Go straight through, past the information desk, into and through “Sights and Sounds” and down the hall. Once you can’t continue going straight, turn right and continue going until just before the African-American collection. The Mencken room is to your right. Note: The Cemetery office is in a building marked “Funeral Home”. Stop there to get a map of the cemetery which notes twenty-five points of interest. Hours: Administrative office: Sun: 11:00 AM-3:00 PM; Mon-Fri: 9:00 AM-5:00 PM; Sat: 9:00-3:00 PM. Directions to the cemetery: Coming from the North: (1) Take I-95 South (towards DC). (2) Take exit “50 A-B Caton Ave.” (3) Bear right, “Exit 50 B—North—Wilkens Ave”. (4) Merge onto S. Caton Road. (5) Go straight on S. Caton Rd, past St Agnes Hospital on your left. (6) Make a left at the light onto Wilkens Ave. (7) The gate to the cemetery at 3620 Wilkens Avenue will be on your right. Directions to the gravesite: The Mencken gravesite is in the northeast corner of section “W”. 1.) Come through the Main Entrance at 3620 Wilkens Avenue. 2.) RIGHT onto the parking lot in front of the funeral home. 3.) LEFT at the carport at the end of the Funeral Home. 4.) RIGHT at the Fernwood signpost. There are mausoleums to your left. You will see the Stewart/Bowman Monument. 5.) LEFT at the T-intersection. You will see the Livingston Monument. 6.) RIGHT at the T-intersection at the Edgevale sign. 7.) RIGHT at the top of the hill at the Edgewood sign onto a traffic circle. 8.) RIGHT at the one-way sign (you will see the Depkin-Nelson Monument). 9.) Go down the hill and across a bridge over a small stream. 10.) Make the SECOND LEFT after crossing the bridge. You will see the signpost marked “YY” and the Eidman Monument in front. 11.) At the “X” signpost jog RIGHT then LEFT. 12.) After perhaps 100 feet keep an eye out on the left side of the road for a dark, stubby granite obelisk-style memorial for “Smith”. 13.) Right next to the Smith family plot is the Hensel family plot. 14.) 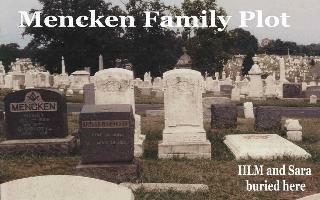 The Mencken family plot is behind the Hensel family plot, the headstones facing away from the road. HLM’s ledger-style gravestone is a large plate on the ground. Remarks: Real fans of HLM may want to bring a gallon jug of water and brush with stiff plastic or straw bristles in order to wash and sweep out the debris which accumulates in the relief-work of HLM’s ledger-style gravestone. From HLM: “Her [Sara’s] ashes are buried at the foot of the grave of my mother, and beside her there is room for mine. Thinking of her, I can well understand the great human yearning that makes for a belief in immortality, but I do not believe in it, and neither did she. We have parted forever, though my ashes will soon be mingling with hers. I’ll have her in mind until thought and memory adjourns, but that is all ... We were happy together, but all beautiful things must end.” — HLM, Diary , Entry for 1940-05-31, p. 143. 2011-10-27 15:12 OP Changed Wood’s to read Polks’s in reference to the Baltimore City Directory for 1887.